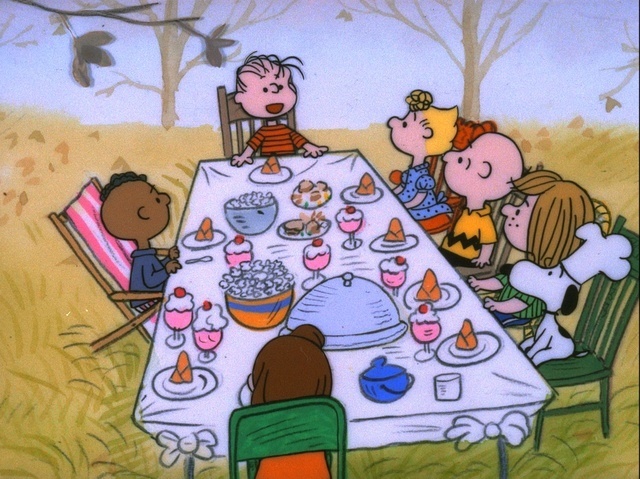 In the year 1621, the Pilgrims held their first Thanksgiving feast. They invited the great Indian chief Massasoit, who brought ninety of his brave Indians and a great abundance of food. Governor William Bradford and Captain Miles Standish were honored guests. Elder William Brewster, who was a minister, said a prayer that went something like this: ‘We thank God for our homes and our food and our safety in a new land. We thank God for the opportunity to create a new world for freedom and justice. I know that many of the students who said these things were excited for the upcoming holiday break, and not just for the prospect of some extra days of rest and recuperation before finals. Most of them expressed excitement to go to the homes of friends and family and take a day to recognize all the goodness in their lives. When I asked, “What are you grateful for?” all responded immediately with lists of sundry personal effects, talents, and relationships they valued immensely. When asked, “To whom are you grateful?” confusion at the question ensued. To give is a transitive verb. On Thanksgiving Day, our nation sees fit to retire from daily commerce to give thanks, the direct object of the day. We all give thanks for many reasons; as noted above, we can enumerate these reasons quickly and well. It is wonderful, even responsible, to be aware of the good things in our lives, and to recognize that our well-being is conditional on the providence of powers beyond ourselves. However, an act of thanksgiving is incomplete, grammatically incorrect, unless the one giving thanks defines the indirect object: to whom we give thanks. Starting at page 131 in “Mourt’s Relation or Journal of the Plantation at Plymouth” one can read the first written account of the American proto-Thanksgiving. George Washington and Abraham Lincoln notably issued proclamations of a thanksgiving holiday. All of these foundational sources for the distinctly American celebration of Thanksgiving note an indirect object of the thanks they give. Even as America continues to change and redefine its relationship of church and state, we continue to find Thanksgiving a fitting and distinctively American holiday. Then let’s give thanks correctly and completely. Whether to a personal benefactor, parent, friend, G-d, Christ, Allah, or your lucky stars, let’s give thanks aright and explicitly respond to whom we are thankful for all the good in our lives.